Stress symptoms: How do you know if you are stressed? You know your family is stressed when...Conversations often begin with "Put the gun down, and then we can talk". If you are stressed, you might notice that not only is your body responding to it (e.g. feeling tired, exhausted), but your behaviour and your emotions are changing too. This is a short general guide to show you what "symptoms" we could get when we are stressed. Can you recognise any of these in yourself? If you are, this shows that your health is already suffering from the stress you are under. 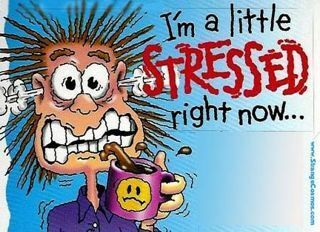 If you haven't looked at my other article Signs and Stages of Stress then have a look at it after reading this article. This will give you a better picture of where you are at the moment and how stress is affecting your life and your body. Headaches, sweating, palpitations, indigestion, irritable bowel syndrome (IBS), muscular aches and pains, skin irritation, constant minor illnesses. Poor concentration, inability to relax, forgetfulness, losing your sense of humor, difficulty in making decisions, increased irritability and mood swings. Making more mistakes, increased clumsiness and accidents, procrastinating, tiredness, nervous habits, obsessional behaviour, interrupting conversations, using more palliatives e.g. tobacco, alcohol, food, drugs. Just to remind you, have a look at the Signs and Stages of Stress article if you haven't done it yet. After that you will understand better where you are on the 'stress scale'. After that, of course, have a look at the recommendations in the How to reduce stress instantly and What to do if you are stressed out articles. If you would prefer to have a look at other interesting topics as well, then go to the Articles Archives or Archives (Page 2) and choose an article to read or a fun psychological test to do.